« The apartment I’m buying. It was delicious too. Go Momma. So everyone knows the Japanese are the masters of cute, right? They made this, and this, and also this. So walking past a restaurant naming Asuza, I noticed something interesting. First of all, they sell fugu. Fugu is a Japanese pufferfish. So what, you say? Oh, there’s more. Fugu pufferfish have poisonous toxins in their ovaries and livers and skin, so if they’re prepared incorrectly, you DIE. Like DEAD. From a food item you chose to eat. And a couple Japanese people die every year from improperly prepared fugu. I guess if you are a restaurant and you pay top dollar for killer pufferfish, you use all the (nonpoisonous) parts of the pufferfish. 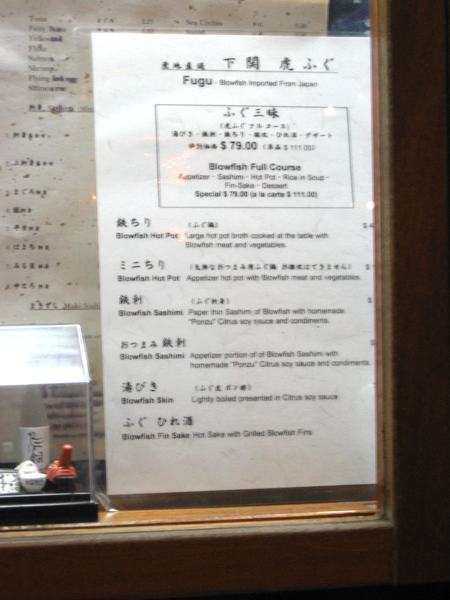 So I photographed the menu with an all-fugu all-the-time menu. There’s fugu appetizers, fugu broth, fugu sashimi, grilled fugu – even sake infused with fugu. Okay, you know what, that’s too much damn fugu. But this is not why intrigued me about this restaurant. 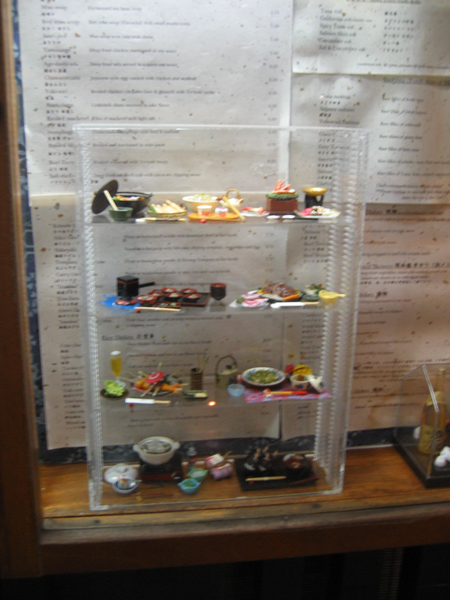 See, Japanese restaurants like to have plastic models of some of their more popular dishes in the windows of their establishment. 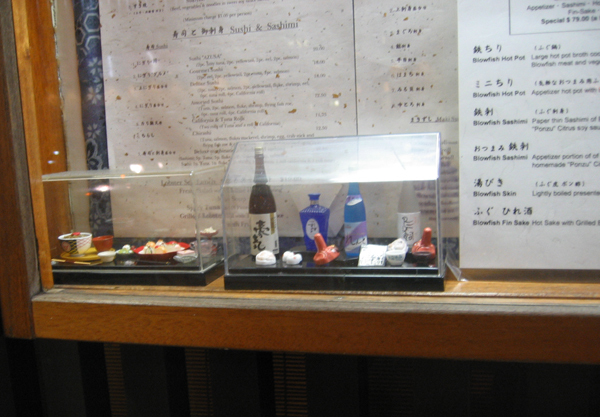 But Asuza has very limited window space, so they made MINIATURE models of all their dishes. See? Is that not precious? Everytime I think the Japanese can’t top themselves in the adorable-ness, they make whatever it is smaller. And rounder. And add sparkles to it. Brilliant, I tell you. 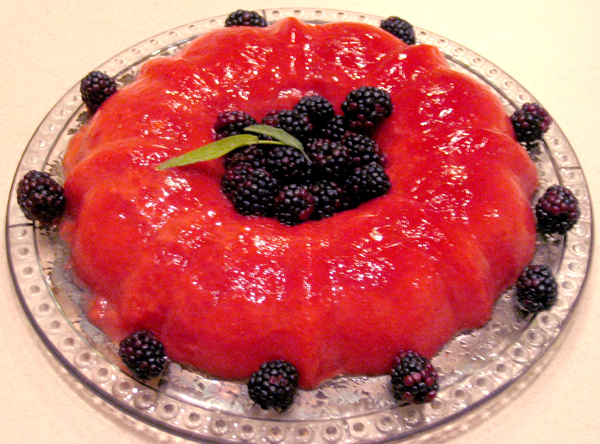 This entry was posted on Tuesday, November 27th, 2007 at 3:46 am and is filed under New York, Stuff, Tasty 'n' Delicious. You can follow any responses to this entry through the RSS 2.0 feed. You can leave a response, or trackback from your own site.